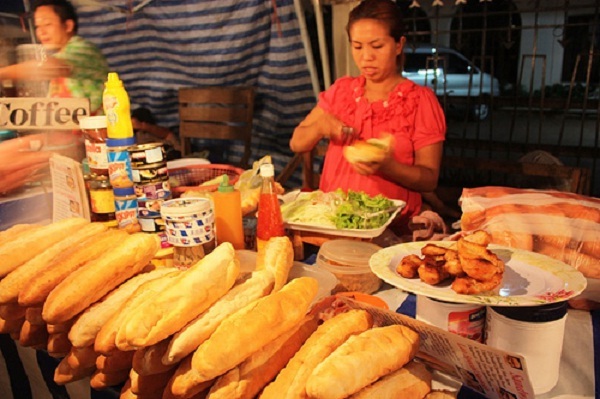 Here are some interesting notes that amaze everyone’s trip when traveling overland to Laos. 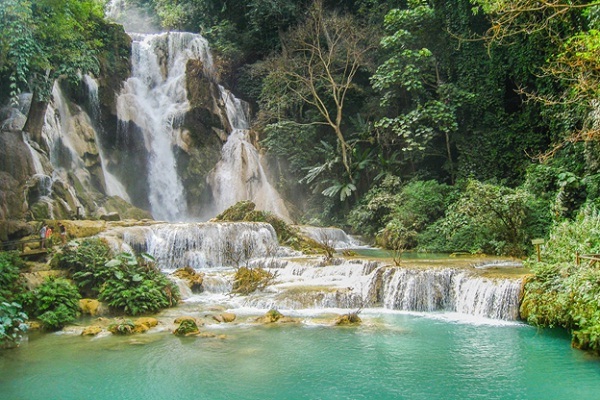 In Laos, there are several maleficent waterfalls to enjoy the nature of the land, for example, Kuang Si waterfalls near Luang Prabang. Travelers usually share a tuk-tuk to go to the destination about one hour. Then, they would go to the top of the waterfalls by climbing for 20 minutes (remember to bring a reliable pair of hiking shoes) so that they can see such a breathtaking sight while overland Laos. If you are brave enough and love swimming, you can swim at the Kuang Si waterfalls, but notice that the water is very cold! While overland Laos, travelers should try to watch a movie in Laos to know how it works. You will not discover a movie theatre in Laos even though a film production company has established. It is thought that there is one family-run movie theatre in Vientiane and one more cinema in Luang Prabang, Laos. They screen a movie daily at 7 p.m for free. The guests should order a meal or a cup of tea only to find a comfortable space to stay and watch the movie in a cozy room. Another wonderful experience in Laos to enjoy is walking along the river or floating on the Mekong. If you come early in the morning, everything is in mist and you can see a few boats moving in silence. While walking along the river, two bamboo bridges that you need to cross and you have to buy a ticket to go through. By buying the ticket, you support locals to build the bridges every new dry season. 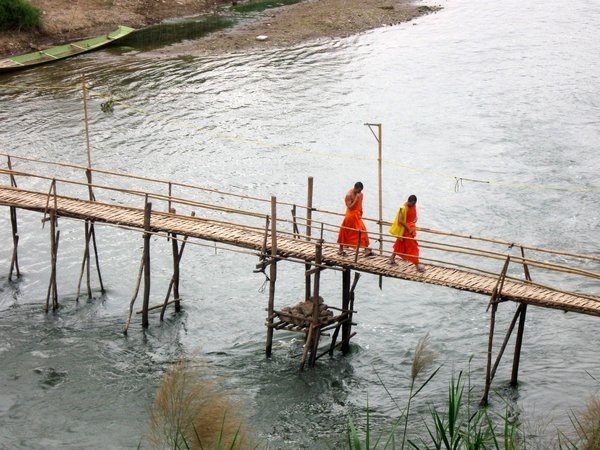 Even overland, backpackers could see many bamboo bridges to cross in Laos. Laotians desire learning English and try in a hard effort to do. Therefore, if you wish to support and help them improve their English; overland and come to Luang Prabang at the Big Brother Mouse Project to have chat. You will have a great opportunity to learn more about their culture and tradition in Laos. 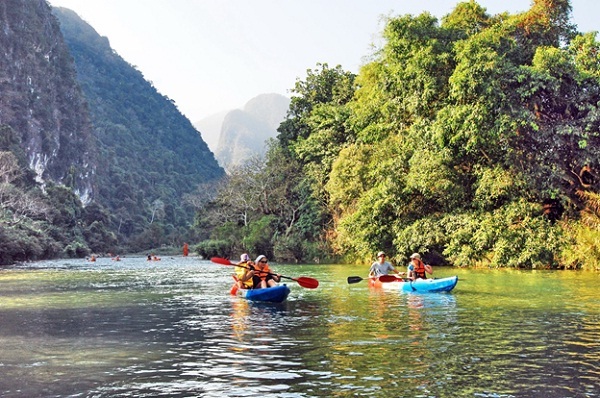 Famously, backpackers usually do tubing or kayaking in Vang Vieng, Laos. It is one of the most wonderful experiences you would have while overland Laos. You just need to pay a little money for two hours of kayaking with transportation to Nam Song River and everything is worth doing. Moreover, you can go for a walk along the Mekong River in Vientiane, Laos. It is a busy place with several food stalls and shops selling souvenir for travelers. This “forgotten country”, Laos possesses several distinctive points that every traveler should overland once to enjoy the peaceful moments that have never experienced before.